Hold It,. I’m not fit after months of training. I guess what happens in Memphis stays in Memphis. Kareem, Angela, we should’ve done that stair stepping machine, for one, and even more vital, should have trained me to squat on my heels without falling over. 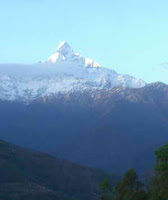 I learned these things today, the first day of the Annapurna trek. Try climbing straight up hill for three hours with a bottle of water in your fanny pack. I was an embarrassment to the gray haired set. I couldn’t even keep up the pace of a slow stroll. But climbing 1700 feet in three hours straight up (to reach about 5400 feet altitude) was no small feat for an oldie like me. You wouldn’t have been proud however as I groaned and cursed at my trek showdown. And then there was the toilet stop at the first resting place. Prayer flags and a stone bench in the shade greeted us. But reality arrived as I confronted the famous hole experience, far afield from my accustomed luxurious comfort. In a dark cell with a concrete floor, there was a hole. The odor was worse than a corralled heard of steers. I had no idea how to hold my trousers and squat without making a mess. It wasn’t a pretty picture because I was afraid to touch the walls. 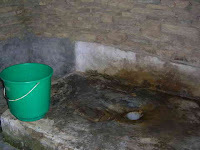 There is a bucket of water and a scoop to clean up any residue. Ahem. Jim, my guide, pointed out it’s the way of toilets found in most parts of the world. I remember similar experiences at gas stations in Uruguay and in some poorer homes. But I survived. I could always go home. As we trekked higher and higher up stone steps, Jim set the pace so I would take small steps, keep moving, and stand up straight. (I think he told me that in Jackson when I was learning rock climbing for the Grand Teton.) Well, once again we were climbing rocks - rock stairs carefully built by the locals so paths don’t grove the soil as they tread up and down these mounta ins for daily activities. Jeta, the lead guide and organizer for Jim, walked close behind me with my backpack on his back, and tried to push me forward if I wobbled backward. He could see my oxygenlessness. Not completely exasperated at me yet, Jim suggested in a calm voice, "Let’s aim at rest stops every fifteen minutes, not every five. It wasn’t my decision, I said, it was my body’s. At moments I just had to lean against something. What was I to do?. The hips were tired, the shoulders sore from pushing myself up on a pair of sticks, the stomach was backfiring gall into my throat, the cranium had increased the fissures so I could press my finger in them, and I had sweated through every layer of clothing I wore. Only thing that not complaining were my f eet. I can’t feel them anyway. Tomorrow, Ibuprofen. After a late takeoff from Pokhara, it was one in the afternoon when we reached a marginal parador called Hotel Orchid Restaurant in Dhampus, a tiny pueblo hanging off the high mountain we had just climbed, tiered with gardens and fields of wheat. It was our first destination. We pondered going on further, but everyone laid down the packs and the giant baskets toting duffle bags and Jim’s mechanical treasures (satellite connections and phones.). I was so thirsty I even drank a Sprite from a bottle - and it was COLD. I don’t drink carbonated drinks but this was desperation. 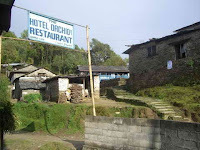 The hotel for trekkers had six rooms and offered only one with a flushable toilet attached to the room. That’s a miracle in these parts. It was mine for one night. Two women work out of a tiny kitchen with no modern appliances so it took a while to complete the luncheon meal we ordered. "Have whatever you want," Jim said. I knew there was no ice cream so I had cornb read Nepali style (corn is grown on the stepped tiers) served with honey. It resembled pita bread when it unpuffed. A spring roll was really an oversized empanada of cheese, tomato and onion but I was loading in the necessary carbs for strength I didn’t seem to have. 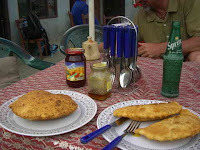 Jim, Jeta and the two sherpas decided on the national Nepali dish, Dahl Bat: rice, lentil soup, greens, fiddlehead ferns, potato salad, and spicy red sauce. It looked so good I’m going to try that next meal. As we ate, we watched ominous black clouds sneaking around the mountains. So we decided to stay here for the night since I’d tackled enough for the first day and I was shivering in the cooling breeze. 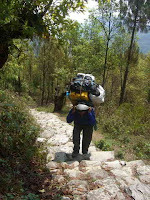 Although Jeta said the next leg of the trek would be high climbs mixed with more flat areas. I was thinking, "Flat? 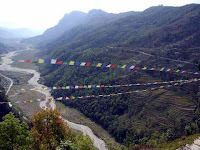 It seems to me there’s no more than 50 feet of flat in all Nepal." I had anticipated that Annapurna would be a breeze, a snap of training to get me ready for Everest. I was wrong and the guys felt my pain. It’s a good thing we stayed our ground. The winds whipped up and Pandora’s Box opened to let lose a thunder overture more bombastic than the 1812 Overture. It was kettle drums by a wild percussionist. All sound became thunder, a thunder I had never experienced before. One hour of stanzas with no break. I kept thinking of the Tiki-Tiki Room at Disney World, except this wouldn’t stop. Maybe God was celebrating the Nepali New Year today. Rain tumble in like a drunken clown. There may be no tornados, typhoons, hurricanes here but this pre-monsoon storm would have had our Memphis TV weathermen dancing jigs across their dopper machines. Lightening, a dagger for trekkers, was endless. Of course, it knocked out the already fragile electricity at our hotel. As night set in, there was not much to do but lay on the bed and listen to sounds of life all around: birds, people, kids, Indian radio music, barking dogs, tea cups being prepared for tea, water draining from the fancy toilet. There are no cars, TV, telephones, airplanes, boom boxes - just life. So I snuggled in my fleece and wrapped my neck in the airplane sized cashmere blanket I had used as a cover at the last hotel. Then out the windows mountains that had been hidden by continual fog and cloud began to exposed themselves with new coats of snow. Then shadows fell on the first clear afternoon as Fishtail, Annapurna one, two, four and south competed for the biggest ahhs. What better entertainment can there be? 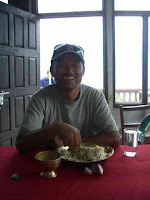 Photos: view from first rest stop; the toilet; our sherpa’s labor; first night’s hotel; cornbread and spring rolls for lunch; Jeta tries Dahl Bak; Fish Tail Mountain in the Annapurna range.